Pool Tables USA.com (“Pool Tables”) is a leading retailer and distributor of pool tables and related game room furniture. The Company has a unique business model that has produced strong growth and high margins in a low-cost structure. MelCap Partners acted as the buy-side advisor in the acquisition of Pool Tables. 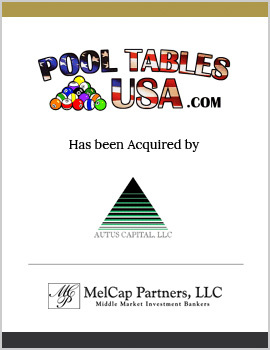 Pool Tables was successfully acquired by a newly formed entity, Meritage Retail Network, Inc., that is owned and controlled by Autus Capital, LLC.